"...a mass transit system in Southern California using streetcars, light rail, and buses. The largest electric railway in the world at its greatest extent, around 1925, the system interconnected cities in Los Angeles County and Orange County, as well as in San Bernardino County and Riverside County. 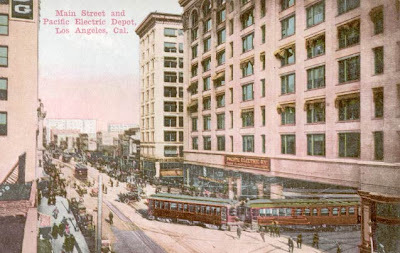 [...] Pacific Electric was the largest operator of interurban electric railway passenger service in the world with over 1,000 miles (1,600 km) of track. The system ran to destinations all over Southern California, particularly to the south and east. [...] The railway company "connected all the dots on the map and was a leading player itself in developing all the real estate that lay in between the dots". [...] Pacific Electric passenger service was sold off in 1953 to a company known as Metropolitan Coach Lines, whose intention was to convert all rail service to bus service as quickly as possible [...] in what became known as the Great American Streetcar Scandal."